Women such as Tiffany are not the sort of clientele that you traditionally associate with pawnbrokers. Nevertheless, in these asset-rich, cash-poor times they are increasingly emerging as their lender of choice. 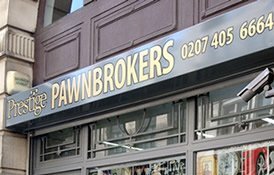 Last year, the National Pawnbrokers Association – whose membership has grown from 530 to 1,800 in the past five years – reported a 15 per cent rise in business, in part fuelled by this new breed of high-end customer. Then there’s the internet, where online brokers offer loans against everything from jewellery to fine wine. At borro.com loans of up to £1 million are available, while at pawnbrokeronline.co.uk applicants can be offered money after a transaction lasting as little as a minute. Meanwhile, over at Prestige Pawnbrokers in Weybridge (a commuter belt with some of the UK’s most expensive houses) designer handbags and dresses – Hermès, Chanel, Dior – jostle for space with expensive jewellery in the locked units behind the discreet shop front that, with its plain counter and sofas, looks more like a bank. The most interesting stuff isn’t on the premises, but in underground vaults containing rare books and paintings, and secure garages that host sleek rows of prestige cars. All of them have been pawned by their owners in exchange for ready cash. Moreover, it is women who are helping to fuel James’s booming business. ‘When we opened women rarely came in unaccompanied by a man, but we’ve seen a huge shift in that sector. Now they form around 65 per cent of our client base. Before, these women could have walked into the bank and said, “My house is worth five million, I just want a few grand on my bank card”, and that would have been fine, but now that’s not possible unless you’re in full-time employment, which doesn’t apply for many of these women. So they come here.’ What are they spending the money on? Anything, it seems – school fees, dentistry work, credit-card bills, even to start their own business. ‘Money has been tight since I got divorced,’ says Lorraine Giacomelli, a mother of two from Richmond, Southwest London, ‘and when my bathroom flooded earlier this year I didn’t have the funds to fix it. I wasn’t covered by my insurance, and while I could have got a loan or used a credit card I didn’t want to be in debt — which is why I didn’t ask my ex-husband either. ‘He had been very generous while we were married and a friend pointed out that I probably had thousands of pounds’-worth of goods tucked away that I could pawn. So I rooted through my wardrobe and found a pair of £1,000 Christian Louboutin shoes, a £2,000 Chanel handbag and a Hermès bag that had originally cost £17,000.